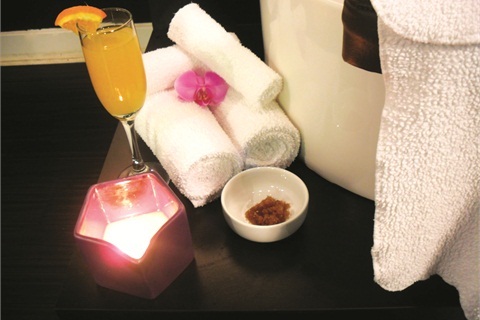 Luxure Nail and Beauty Bar, Chicago, uses: Qtica Smart Spa Cool Anti-Bacterial Spray; Haken Coconut Papaya Wash; Cake Beauty Desserted Island Smoothing Brown Sugar Body Scrub; Scandle Coconut Kiss Body Lotion and Body Massage Candle; base coat, polish, top coat. 1. Give the client a complimentary Island Breeze Mimosa, and let her borrow an iPad Mini to browse. Spray her feet with Qtica Smart Spa Cool Anti-Bacterial Spray. 2. Soak the client’s feet in warm water and Haken Coconut Papaya Wash for about 10 minutes. 3. Prep the client’s nails. 4. Exfoliate the client’s feet and lower legs with Cake Beauty Desserted Island Smoothing Brown Sugar Body Scrub. 5. Massage the client’s feet and lower legs with Scandle Coconut Kiss Body Lotion and Body Massage Candle. 6. Apply base coat, two coats of polish, and top coat.